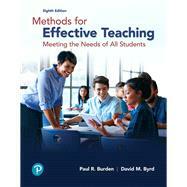 Methods for Effective Teaching helps teachers with every aspect of their day-to-day responsibilities. Readers learn about everything from planning and choosing the right instructional strategies, to delivering lessons, managing the classroom, disciplining students, assessing progress, and collaborating with colleagues and parents to actively engage students in learning. Numerous features, tables, and lists of recommendations help readers apply concepts and think critically about the decisions they’ll have to make in their teaching careers. All of the content is aligned to professional standards, including the InTASC standards. Additionally, this book is designed to help prepare readers for topics covered on teacher licensure exams, such as the Praxis PLT, and performance assessment evaluations. This new edition covers contemporary issues such as culturally responsive teaching, differentiated instruction, technology, and data-driven decision making. The Enhanced Pearson eText provides a rich, interactive learning environment designed to improve student mastery of content with embedded videos. Paul R. Burden is an assistant dean and professor in the College of Education at Kansas State University, Manhattan, where he has supervised student teachers and taught courses on teaching methods, classroom management and discipline, foundations of education, and instructional leadership. Currently, he is the college’s accreditation coordinator. Previously, he was a middle-level science teacher in Buffalo, New York, and later earned his doctoral degree at The Ohio State University. He has received the College of Education’s Outstanding Undergraduate Teaching Award at Kansas State University and the Distinguished Service award from the National Staff Development Council. His publications include Classroom Management: Creating a Successful K—12 Learning Community (2017, John Wiley & Sons), Countdown to the First Day of School (2006, National Education Association), Powerful Classroom Management Strategies: Motivating Students to Learn (2000, Corwin Press), as well as Establishing Career Ladders in Teaching (1987, Charles C Thomas). He served for 11 years as the editor of the Journal of Staff Development, a quarterly journal sponsored by the National Staff Development Council, and he has presented over 70 papers at regional and national educational conferences in addition to authoring 15 articles and four book chapters. Married with three children, Dr. Burden enjoys traveling with his family and working on genealogy. He can be contacted at Kansas State University, 7 Bluemont Hall, Manhattan, Kansas 66506; 785-532-5595; burden@ksu.edu. David M. Byrd is director of the School of Education at the University of Rhode Island. He is a graduate of the doctoral program in teacher education at Syracuse University. Prior to coming to Rhode Island, he was an associate professor at Southern Illinois University. He has a long-term professional and research interest in programs for beginning teachers and teacher professional development. Dr. Byrd has authored and co-authored over 30 articles, books, and chapters. He has served as co-editor of the Association of Teacher Educators’ Teacher Education Yearbook series (2000—2006). Yearbook titles that he edited include Preparing Tomorrow’s Teachers: The Field Experience, Research on the Education of Our Nation’s Teachers, Research on Career Long Teacher Education, Research on Professional Development Schools, and Research on Effective Models for Teacher Education. He has served as chairperson of the Research Committee for the Association of Teacher Educators and on the journal board for Action in Teacher Education. Dr. Byrd can be contacted at the University of Rhode Island, 706 Chafee Hall, Kingston, Rhode Island 02881; 401-874-5484; dbyrd@uri.edu.